Simple and straightforward. 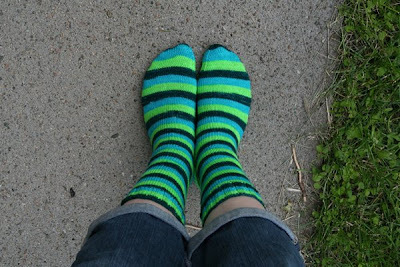 This is Vesper Sock yarn from Knitterly Things, in the Algae colorway. After months of begging, boringknitter finally sold it to me to get me off her back. Aren't the colors lovely? They are knit in plain old stockinette, per basic instructions in Sensational Knitted Socks by Charlene Schurch. I used my usual heel flap and gusset construction with a wedge toe. 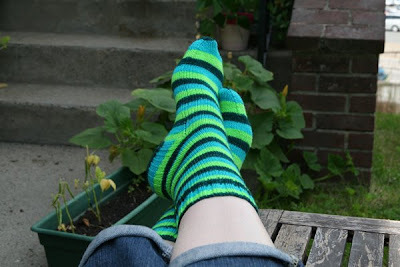 There is not much else to tell you about them except that I'm very happy to have my new pair of pretty striped socks! I recently bought a copy of Sock Innovation by Cookie A. and have just begun a pair of socks from that book. I'll share progress once I have more than a cuff. I'm pretty excited about the patterns in this book, and all the sock design information at the beginning is fantastic. Stayed tuned for sock progress shots! Those look great! And you knit them up way before I ever would've used the yarn.